Sgt. 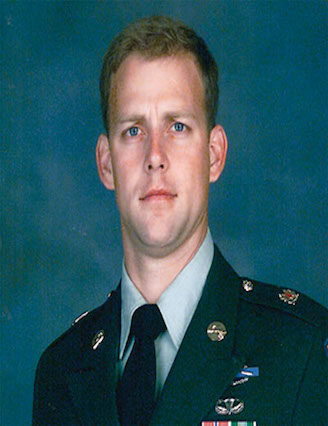 1st Class Trevor John Diesing died Aug. 25, 2005, while conducting combat operations in Iraq against known enemies of the United States of America. He was born May 16, 1975 in Red Wing, Minn. He entered the U.S. Army as an infantryman May 24, 1993, and after completion of initial entry training, was assigned to 3rd Battalion, 3d Infantry Regiment of the Minnesota National Guard. Since that time, Diesing served in 2nd Battalion, 187th Infantry Battalion, 101st Airborne Division and 1st Battalion, 10th Special Forces Group (Airborne). His last assignment was as a team member assigned to the United States Army Special Operations Command, Fort Bragg, N.C.
Diesing graduated from a myriad of military courses, while in the Army. He completed the Air Assault Course, the Ranger Course, the Basic Airborne Course, the Static Line Jumpmaster Course, the Special Forces Assessment and Selection Course, the Special Operations Engineer Course, the Military Freefall Course and the Basic Noncommissioned Officer Course. Diesing’s awards and decorations include the Bronze Star Medal (2), the Army Commendation Medal, the Army Commendation Medal for valor, the Army Good Conduct Medal (2), the National Defense Service Medal with bronze service star, the Iraq Campaign Medal, the Global War on Terrorism Expeditionary Medal, the Global War on Terrorism Service Medal, the Noncommissioned Officer Professional Development Ribbon with numeral two, the Army Service Ribbon, the Combat Infantryman Badge, the Expert Infantryman Badge, the Parachutist Badge, the Pathfinder Badge, the Military Freefall Parachutists Badge, the Air Assault Badge, the Ranger Tab and the Special Forces Tab. He was posthumously promoted to the rank of Sgt. 1st Class and awarded the Purple Heart and the Defense Meritorious Service Medal. Diesing is survived by his wife, Lori; sons, Cole and Maddox; and his parents, Lonnie and Debra Diesing.